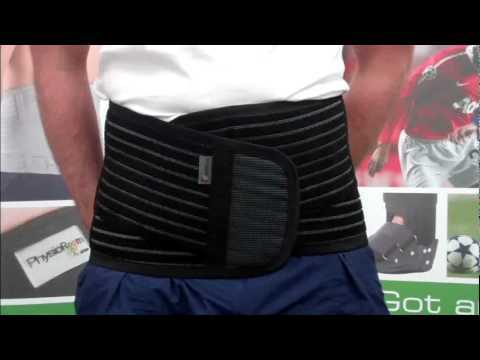 What is the PhysioRoom Elite Sports Back Brace Extra Support Pain Relief? Ideal for work sports and everyday wear, this is a top quality back brace, with a 3-dimensional multi-filament construction, plus six reinforcing metal stays. Elastic loops and hooks, plus two removable side panels, allow you to adjust the level of support and compression. It's lightweight and breathable, making it ideal for sports and work use. This soft-to-the-touch back support features a 3-dimensional multi-filament construction, and 6 metal stays, which provide comfortable support, compression, heat retention and back pain relief. A combination of elastic loops and hooks, plus two removable side panels, allows you to adjust the level of support and compression. The extended back panel design gives excellent support to the spine and the option of removing the metal stays to use the brace as an abdominal binder. PhysioRoom Elite Sports Back Brace - Extra Back Support & Pain Relief for Sciatica, Herniated Disc is in stock and available for immediate dispatch from our Warehouse facility in Lancashire, UK. Orders placed by 4pm Monday to Friday (excluding Bank Holidays) are dispatched the same day. If you need your PhysioRoom Elite Sports Back Brace - Extra Back Support & Pain Relief for Sciatica, Herniated Disc in a hurry, next working day delivery is available for UK mainland addresses.